While you’re in Manuel Antonio Quepos Costa Rica you won’t want to miss out on this unique, eco-friendly Segway Jungle Island Tour that will put you directly on jungle trails and white sand beaches full of wildlife. Enjoy gliding along on a new 2014 Off Road Segway x2 while viewing and hearing about local wildlife. We will ride a water ferry from Quepos with the Segway’s to explore the Pacific Island just off the mainland unspoiled by cars. This beautiful Jungle island is full of wildlife, remote beaches, and a small fishing village of friendly native people. As you glide along the Pacific Island you will experience spectacular views and hear all about it’s rich history and the native people. We provide training on the Off Road Segway, safety equipment, natural drink, a bottle of water, and lunch or dinner overlooking the Pacific. 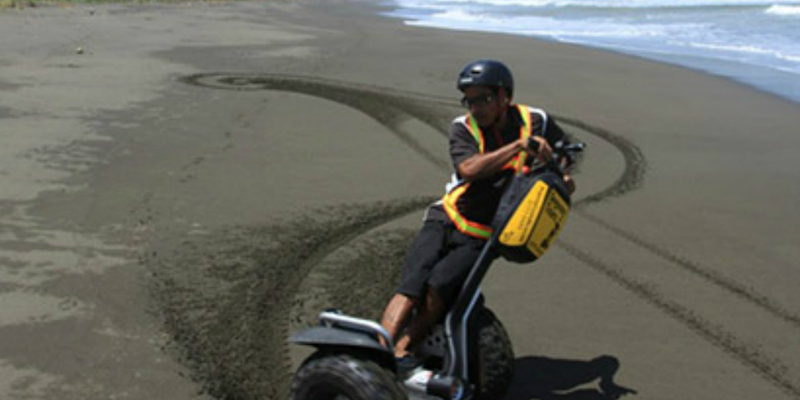 Costa Rica Tours have the latest 2014′ Segway Off Road Segway’s.